Summary: We have given you a week of savory St. Patrick’s Day dishes, now time for a little sweet! This vegan and gluten free dish combines gorgeous purple cabbage with sweet apples. Now this dish isn’t technically Irish, but it does use cabbage so we thought it could pass! We have given you a week of savory St. Patrick’s Day dishes, now time for a little sweet! This vegan and gluten free dish combines gorgeous purple cabbage with sweet apples. Now this dish isn’t technically Irish, but it does use cabbage so we thought it could pass! The sweetness of these apples are offset by the tart vinegar. A perfect balance of sweet and sour. Most recipes call for the addition of brown or white sugar, but because we have included the option of candied almond slivers on top, we aimed to keep the sugar content low. We instead used just a little Agave syrup and it is still sweet and delightful. Shred cabbage and chop apples and add them to the pot. Stir in apple cider vinegar, margarine, cinnamon, allspice, cloves and Agave syrup and turn heat to “high.” Once the liquid has come to a boil, stir again to make sure that the ingredients are well incorporated, then turn the heat to medium-low and cook for 45 minutes. While that is cooking, make the almonds. Add both ingredients to a skillet on medium-high heat. Stir until sugar is melted (be careful not to burn!). Once melted, remove from heat. 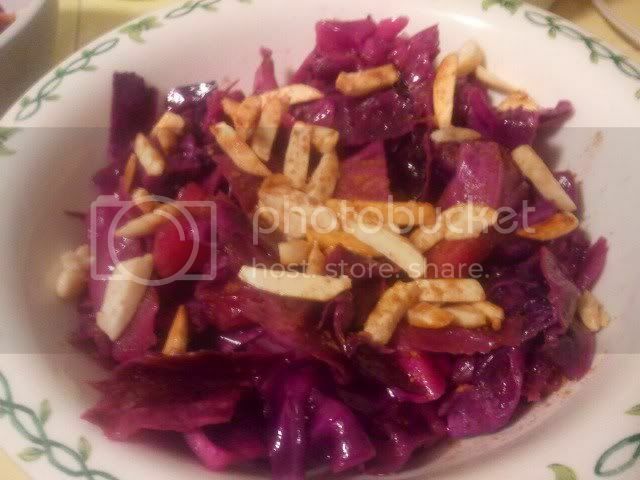 Spoon cabbage and apples into bowl and sprinkle candied almonds on top. Add another dash of cinnamon on top and serve.